Lifeng Liu is currently the Leader of the Nanomaterials for Energy Storage and Conversion (NESC) group at INL. 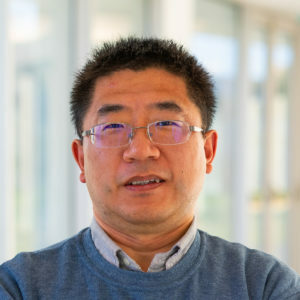 Dr. Liu focuses his research on the development of new nanostructured materials and their applications in electrochemical energy storage and conversion including water splitting, solar fuel production, lithium-/sodium-ion batteries, and supercapacitors. Lifeng Liu has a PhD degree in Condensed Matter Physics from Chinese Academy of Sciences and did his post-doctoral work at Max Planck Institute of Microstructure Physics during 2007-2009. Before joining INL in 2011, Dr. Liu was a staff scientist and group leader at Max-Planck Institute of Microstructure Physics. He was the recipient of FCT Investigator Grant 2014, Young Investigator Award 2015 by the Portuguese Electrochemical Society, and the Scientist Medal 2018 by the International Association of Advanced Materials (IAAM). Energy Environ. Sci. 2018, 11, 1819. Nano Energy 2015, 16, 130-142. One-step synthesis of self-supported nickel phosphide nanosheet array cathodes for efficient electrocatalytic H2 generation. Angew. Chem. Int. Ed. 2015, 54, 8188. Nickel foam supported mesoporous MnO2 nanosheet arrays with superior lithium storage performance. Chem. Commun. 2013, 49, 8459.